Learn design-thinking from Post-It masters- See how HealthTech startups enhance ideas! At the beginning of October, we gathered our 11 Nordic HealthTech startups in Copenhagen for our 2nd event- Design Thinking Workshop facilitated by Copenhagen Institute of Interaction Design (CIID). 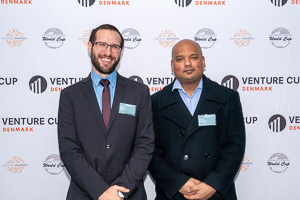 The workshop was hosted at Copenhagen Bio Science Park (COBIS) for 2 days, then joined the University Startup World Cup with the 65+ teams from the world, and networked with USWC HealthTech teams at the Danish pharma giant, Novo Nordisk Fonden. “The second workshop taught me the importance of using thinking tools, like the business model canvas or the social venture canvas. These tools can reveal blind spots and force one to be explicit all of which helps one think more clearly and systematically about complex problems.”- said Toke Faurby, CEO of TresActio. Under the lead of the facilitators of CIID, the startups followed the step by step instruction to use all the physical tools like post-its and working sheets to put ideas on paper. Polaris Proteins has developed a novel expression system, based on a cold-adapted bacterium, that offers simplified production of difficult-to-express proteins, including increased solubility and more active enzymes. Check out more here. The design thinking mindset supports the startups to clarify their value proposition, understand the bio, medical and pharma industry, and deliver a more compelling pitch to their target audiences. “By listing the pain and gain of customers, we had some good inputs about where and how we should focus.” – said Niels Lindeburg, CTO of VasDeBlock. VasDeBlock develops a new and innovative male contraception method for couples around the world. It doesn’t hold hormones, it doesn’t require surgery, it’s far more practical than condoms. And it’s reversible! Check out more here.